Earlier this month, I started a daily exercise using the following phrase as a writing prompt: "Day X of 25 Days of Sherpa Family Christmas." My intent was to generate (mostly) new material, inspired by actual holiday happenings around the Sherpa family FOBstead. It was like writing tactical fortune cookies while channeling my inner Martha Stewart. Listed below are collected all of the "25 Days of Sherpa Family Christmas." (Thanks to the Facebook friends of Charlie Sherpa, who inadvertently served as a daily writers' workshop!) For fun, I've hyperlinked to some definitions and explanations. Best wishes to all for a safe and rewarding holiday! 1. "This is our Christmas tree. There are many like it, but this one is ours." 2. Poncho liner makes surprisingly effective field-expedient tree skirt. 3. Three cups of Peppermint chai before one talks of holiday business. 4. First test of homemade MICLIC rocket for deploying holiday lights across perimeter of FOB Sherpa. Essayons! 5. Tinsel works as a festive and fabulous ghillie suit. Chaffs a bit, though. 6. Lutefisk is the MRE omelet of the holiday-food world. 7. Ask your chaplain if she'll accommodate Saturnalia services on the 17th. 'Tis the season! 8. Lesson-learned: Infrared twinkle lights require night-vision egg-noggles. 9. "Over the river and through the woods" should not require a formal convoy clearance. An extraction plan, however, is recommended. 10. In the mailbox today: "Season's greetings from the IO section." 11. Glitter is a persistent agent. Deploy it wisely. 12. Tactical Advent wreath? Use IR chemlights as candles. 13. Mistletoe can also be ordered in bulk as a Class IV barrier material. 14. 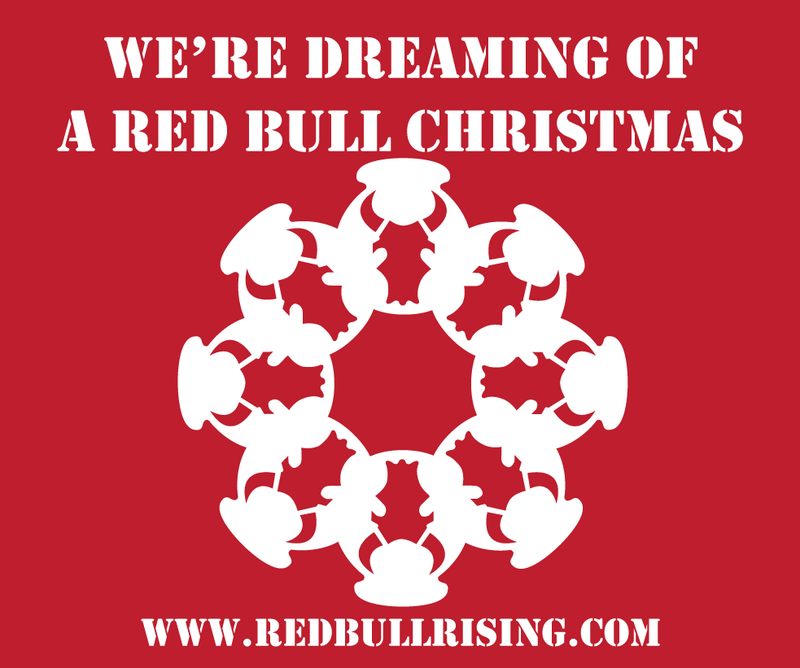 "We're dreaming of a Red Bull Christmas." 15. Sherpa kids initially not interested in crafting pine-cone birdfeeders using peanut butter and suet this past weekend. Told them we were making festive sticky bombs instead. 16. You know something? Engineer tape makes for some darned fancy ribbon! 17. "Treat Christmas like a Key Leader Engagement." 18. Santa's challenge coin is the one that rules them all. 19. Psyop section always has the best holiday music playlist. And they'll DJ. 20. Just like ACU trousers, Christmas stockings can be used as floatation devices in the unlikely event of a water landing. "Knowing is half the battle." 21. Notes and maps left for Santa should be red-light readable. Santa is tactical. And an aviator. 22. Roasting chestnuts by an open MRE heater is ... not recommended. 23. Trail camera mounted on Christmas tree. RC drones on stand-by. Sherpa kids have put Santa on the HVT list this year. Then again, like they say, "the jolly old elf also gets a vote." 24. Airborne Santa says: "Geroni-mo-ho-ho!" 25. Message of the day: "Peace on earth! Goodwill toward all personnel!" Operation Reindeer Games 2014: This is Not a Drill! 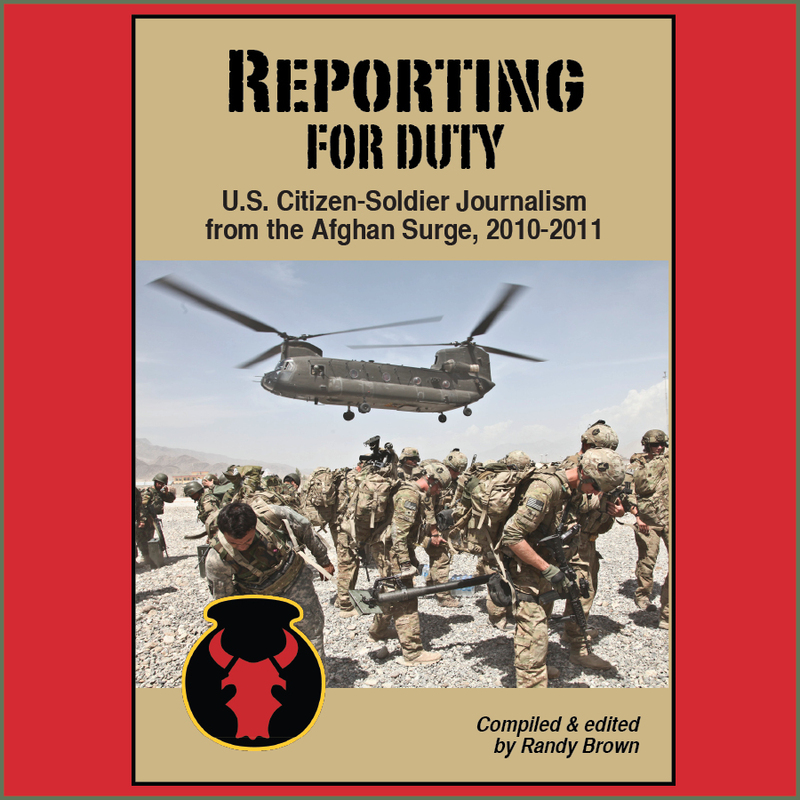 Blog-editor's note: This post was originally published on the Red Bull Rising blog Dec. 23, 2013, and again here at the now-archived mil-blog digest "The Sandbox." We've since FRAGO'd the dates and the illumination data, and topped it off anew with a holiday shot (above) from the Minnesota National Guard's 2nd Battalion, 147th Assault Helicopter (2-147 A.H.B. 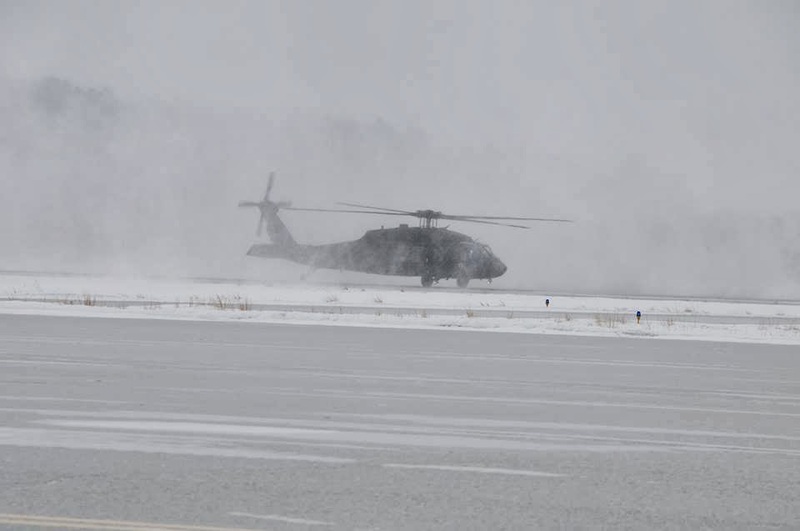 ), 34th Combat Aviation Brigade (34th CAB). Those Red Bull aviation soldiers are currently deployed to Camp Beuhring, Kuwait, and elsewhere. Check out more photographs from "Task Force Shield" at here or here. And remember those deployed and their families in thoughts and prayers this holiday season. The moon on the breast of the new-fallen snow is not likely to give the lustre of mid-day to objects below. Moonset is 242017DEC14; peak illumination is 10 percent. Civil twilight is 250708DEC14. Sunrise is 250739DEC14. "TF SHERPA secures LANDING ZONE CHIMNEY NLT 242330DEC14 and conducts resupply via reindeer-drawn miniature sleigh during hours of darkness prior to 250710DEC14. On order, commences opening of presents and distribution of holiday themes and messages." We will start by ceasing all garrison activities, troop movements, and roving patrols beginning 242100DEC14. No personnel should be stirring. Not even a mouse. Stockings will be hung by the objective with care. All SUGARPLUM elements will be nestled all snug in their bunks. Headquarters will redeploy public affairs team member SCOOP from OP ELFONSHELF to vicinity LZ CHIMNEY for documentation of gift-giving operations NLT 250700DEC14. 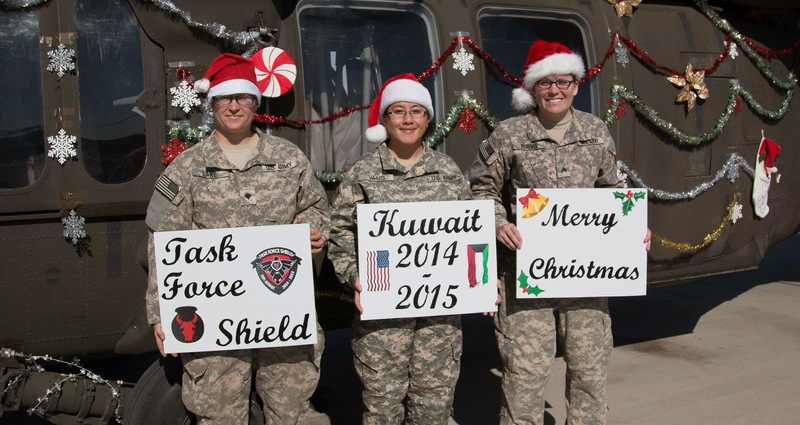 Mission focus will be on "telling the Christmas story by telling our Army story." 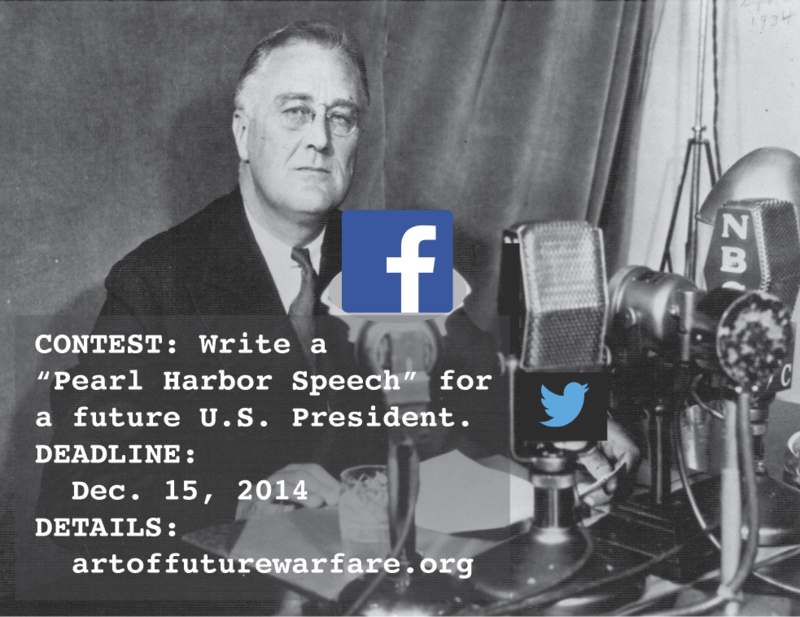 In a short-fuze writing contest, the Atlantic Council's "Art of Future War" project is soliciting short, speculative creative writing that presents a future U.S. president's message after the country has experienced a Pearl Harbor-like attack, circa 2041. Deadline is Mon., Dec. 15, 2014. What would a Pearl Harbor-like surprise for the United States look like in the 2040s? This seven-day Art of Future Warfare challenge seeks a futuristic interpretation of the opening of President Franklin Delano Roosevelt’s "Day of Infamy" address to Congress on December 8, 1941—a day after Japanese forces struck Pearl Harbor with an unexpected attack that would draw America into a global conflict the likes of which the world had never seen. The setting for this challenge is 30 years in the future, but the geography, events and actors included in this presidential address are up to you. For details and writing prompts, click here. The purpose of the council's series of "war-art" challenges is to showcase the value of creative thinking in the national security realm and gain insight into the future of warfare. In summer 2015, the organization's Brent Scowcroft Center on International Security plans to publish an electronic compilation of the best of these and other national security themed art and writing. Entries should, at a minimum, re-imagine the content of the first four paragraphs of the speech. A panel of Atlantic Council experts and War On The Rocks editors will select the winner, who will be announced by Dec. 22, 2015. The creator of the best entry will receive a copy of Atlantic Council Strategic Foresight Initiative Director Mat Burrows' new book, "The Future, Declassified: Megatrends That Will Undo the World Unless We Take Action" and an Atlantic Council coffee mug. The best entry and the creative process will be featured on the Art of Future Warfare project website. Entries must be the creator's original work. Select runner-up entries will be featured on the project's website. While authors may publish under a pseudonym, a C.V. or biography is required. The Atlantic Council project has also issued a "war-art" challenge for longer-form, fictionalized journalistic accounts of events leading to a larger-scale conflict among nations. Stories written for "The Next Great War" challenge should be between 1,500 to 2,500 words. Deadline is Dec. 31, 2014. It has been said that journalists write the first rough draft of history. Through the rise of radio and television, written accounts still define how the enduring narratives around how we come to understand the historic points at which everything changes. A century ago, an angry nationalist in Sarajevo opportunistically aimed his pistol at the heir to the Austro-Hungarian Empire, killing Archduke Franz Ferdinand on June 28, 1914. What followed was "the war to end all wars." Yet it was not the end. The tank, the machine gun and the warplane wracked Europe’s battlefields for the first time as the conflict set the stage for further tragedy in the 20th Century. For more details and creative cues, click here. The Iowa National Guard's 34th Army Band, based in Fairfield, Iowa, will be presented the Croix de Guerre with Palm, a battle streamer the unit earned during its campaigns of World War II but was never formally awarded. The oversight was recently discovered during a routine review of the unit’s lineage and honors. The presentation will be held on Sat., Dec. 13, beginning at 2 p.m., at the Iowa Army National Guard Armory, 1501 W. Stone Ave., Fairfield, Iowa. The award ceremony will be followed by a community concert by four of the 34th Army Band’s Music Performance Teams. Members of the public are welcome and encouraged to attend this event. "An elite Division, whose loyal and efficient cooperation with the French divisions, which begun in Tunisia, was gloriously continued throughout the Italian campaign. During the operations of Belvedere, the 34th Infantry Division, despite the difficulties of the moment, displayed the most courageous actions in support of the operations of the 3rd Algerian Division." During action in World War II, the band fought in campaigns at Tunisia (North Africa), Naples-Foggia, Anzio, Rome-Arno, North Apennines and Po Valley (Italy). Today, there are two bands that trace lineage through the history of the U.S. 34th Infantry "Red Bull" Division. One is a Minnesota National Guard Unit: The 34th Inf. Div. Band, headquartered in Rosemount, Minn. The division band traces its lineage to the 1st Infantry Band, (Minnesota National Guard) organized in April 30, 1900. The unit was redesignated the 135th Infantry Band in 1917 for federal service in World War I as part of the 34th Infantry Division. The 135th was activated in 1941 for service in WWII. The 135th Infantry Band arrived in Ireland in 1942 and earned the distinction of being the first U.S. band to play in the European Theater of Operations. 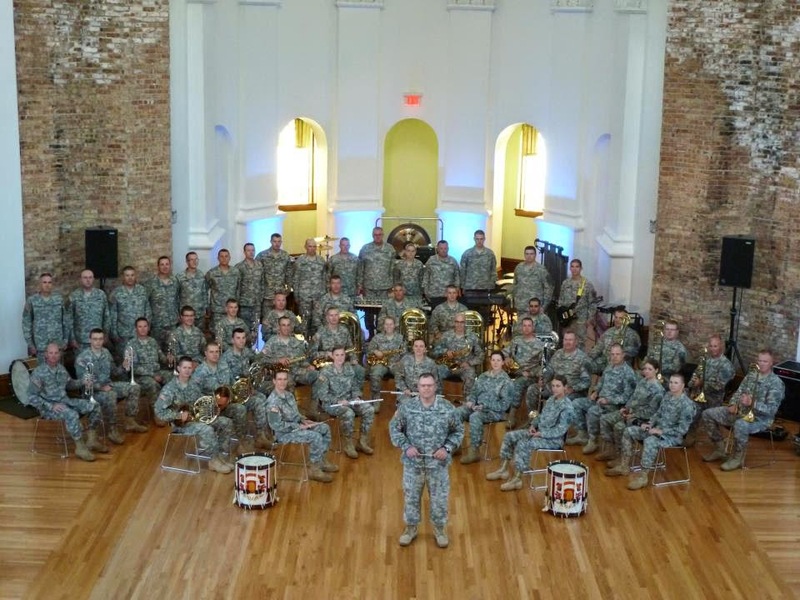 The other "Red Bull" legacy band unit is the Iowa National Guard's 34th Army Band, headquartered in Fairfield, Iowa. Concurrent to the 135th in World War II, the 133rd Infantry Band (Iowa Army National Guard) was deployed to Africa and Italy as part of the 34th Infantry Division. The 133rd earned the distinction of landing with the first contingent of U.S. troops in early 1942 as a part of the Allied Expeditionary Force, and became known as the "Oldest Band" in the European Theater of Operations. On Jan. 1, 1944 the 135th Infantry Band (Minnesota Army National Guard) was combined with the 133rd Infantry Band (Iowa Army National Guard) to create the 34th Infantry Division Band. An official webpage about the Iowa National Guard band unit is here. An official Facebook page for the Iowa band organization is here. An official webpage about the Minnesota National Guard band unit is here. An official webpage about the Minnesota band organization is here. Minnesota Army National Guard Col. Mike Wickman, the chief-of-staff for the 34th Infantry "Red Bull" Division, says the headquarters' pending 2015 deployment to an Ebola-response mission in West Africa is the result of unit readiness, timing within the Army force-generation cycle ("ARFORGEN"), and an exemplary performance at last summer's Warfighter Exercise at Fort Leavenworth, Kansas. Wickman made his comments during an interview with Minnesota Military Radio Hour released Nov. 30. The weekly show is a privately syndicated program produced by Today's Business Radio, Minneapolis. 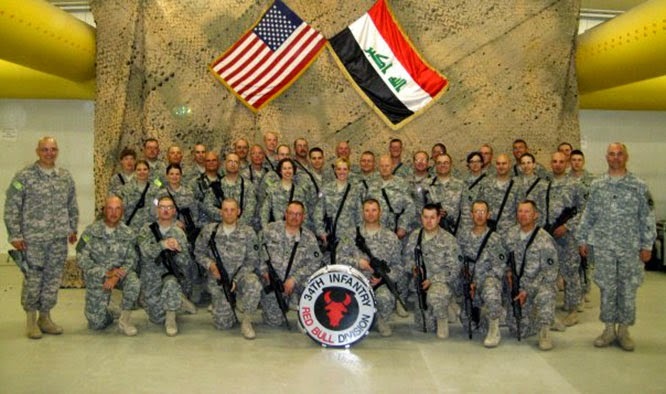 As part of Operation United Assistance, the 34th Inf. Div. headquarters will next spring replace the active-duty Army's 101st Airborne Division (Air Assault)—the "Screaming Eagles." 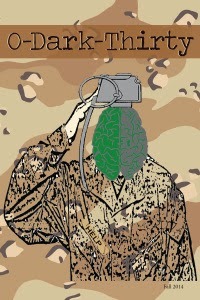 The 34th Inf. Div. commander, Maj. Gen. Neal Loidolt, will lead the mission. "The 34th 'Red Bull' Inf. Div. is a proven, versatile, and capable force," said Wickman, the officer in charge of coordinating the headquarters staff functions. "It's prepared to lead military forces during this humanitarian mission, just as we've done in previous peacekeeping and warfighting missions—Bosnia, Kosovo, Afghanistan, Iraq. We train to the exact standard of the Active Component, and we're in the Army Force Generation cycle to be ready for potential deployments, and have recently successfully completed an Army Warfighter evaluation exercise." Wickman told radio host Tom Lyons that the unit of 700 Minnesota citizen-soldiers is anticipated to mobilize and deploy around March or April 2015, and to deploy for roughly six months. The division's mission of "provide command and control to subordinate units" will remain unchanged, although specifics remain to be determined. Deployed soldiers will not be providing medical care directly to Ebola patients, Wickman said. "Along with the standard deployment training that we'll receive, we'll also be receiving a great deal of mobilization medical training that will prepare us specifically for any of the environmental hazards that we expect to face," said Wickman. "[...] Not only will we receive very specific medical training to prepare us for the environmental conditions, but we'll get all the equipment we'll need to provide protection, and to avoid the risks we could face while we're overseas." This past summer's Warfighter exercise was billed as the largest-ever of its kind, calcuated by number of participating units. 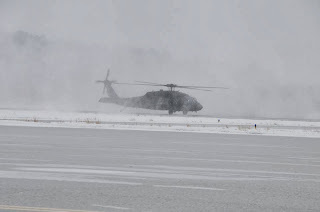 The training event involved approximately 2,500 soldiers, comprising more than 20 units from 14 states, including National Guard units from California, Colorado, Indiana, Idaho, Iowa, Kansas, Mississippi, New Jersey, North Dakota, Pennsylvania, Washington, and Wyoming. Army Reserve units from California and Colorado also participated, as did and active Army units from Fort Sill, Okla. and Fort Riley, Kansas. 1. 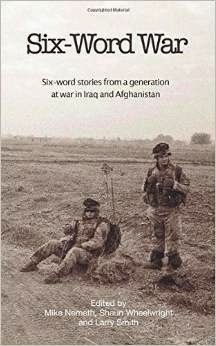 "Six-Word War: Six-Word Stories from a Generation at War in Iraq and Afghanistan"
"Reviewed here. Now in paperback here." How's that for six words? 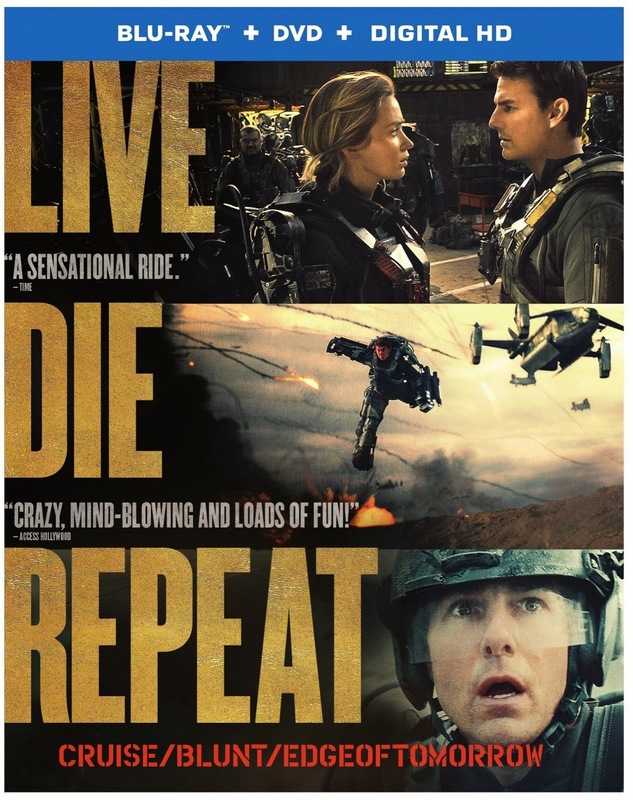 It's "Groundhog Day" (1993) meets "Starship Troopers" (1997)! The ultimate sci-fi deployment pron for former Army lessons-learned guys! Your results, of course, may vary. 3. 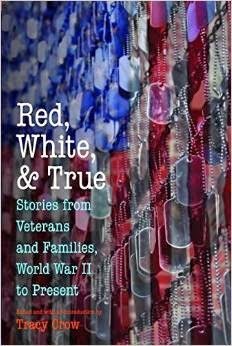 "Red, White, and True: Stories from Veterans and Families, World War II to Present"
I keep one of these handy as ammunition against those who would argue that "fiction is the only way to tell the truth of war." Readers, take note: I might embellish, but I don't feel the need to make things up. Collections like this demonstrate the power of sticking to the facts. 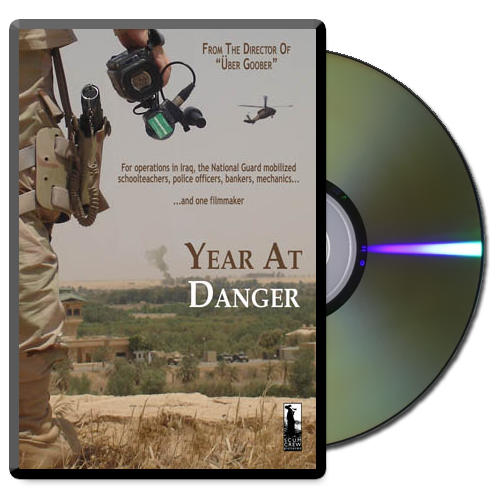 An Iraq War documentary by West Point graduate, Texas National Guard citizen-soldier, and fellow Telling Project alumnus Steve Metze. It tells the story of Metze's 2005 deployment to Iraq—he served at FOB Danger, near Tikrit—just nine days after his wedding. Of all that I've read, viewed, or experienced regarding the wars in Iraq and Afghanistan, this is the thing that has most accurately and effectively captured the National Guard deployment experience. This is what happens when we send our neighbors off to war. 5. 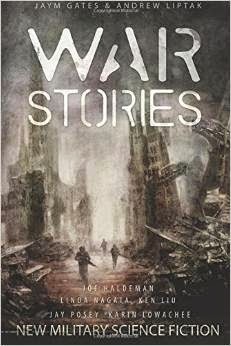 "War Stories: New Military Science Fiction"
I started reading military science fiction in the 1970s and '80s, and rediscovered it when I put John Scalzi's "Old Man's War" in my cargo pocket for Afghanistan in 2011. This anthology of new military science-fiction offers emerging visions of what war might come to look like, from human-led robot squads to a weaponized version of Facebook. 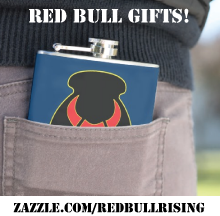 Originally designed in 2013 with a little help from the Sherpa kids, we digitized the Red Bull "snowflake" and put it on coffee mugs and greeting cards at the new Red Bull Rising Zazzle store. 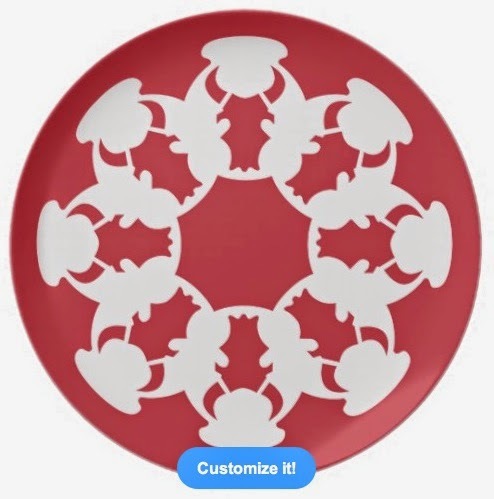 Our favorite item is this cookie plate, which has successfully infiltrated the indigenous holiday decor. Bonuses: Dishwasher-safe! Household-6-approved! Only $30 for a four-issue subscription! 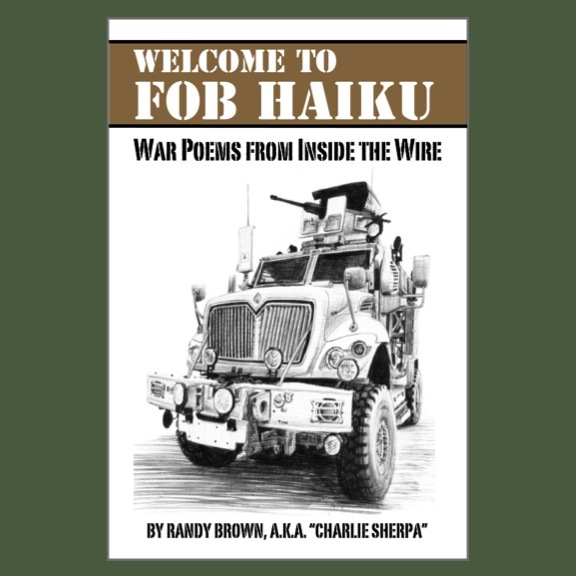 Quarterly hits of veterans' fiction, non-fiction, poetry, and more! Keep writing! Keep reading!